In the course of 20 years, the Tapiola Sinfonietta has evolved into an accomplished, diverse and distinguished orchestra equally adept at performing the Viennese Classics and contemporary repertoire open-mindedly, boldly and with impeccable professionalism. Its innovative programming and unquenchable passion for music have lasted through the years, and the orchestra has received excellent feedback for both concerts and recordings. 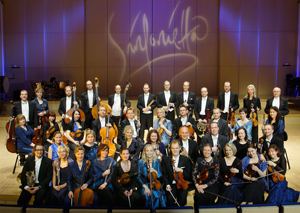 The normal lineup of the Tapiola Sinfonietta is that of a Viennese Classical symphony orchestra, with 41 members. The orchestra appears with both visiting soloists and with members of the orchestra itself as soloists. It does not have a chief conductor; artistic responsibility rests with the members themselves. In 1993, French violinist and conductor Jean-Jacques Kantorow was invited to become artistic director of the Tapiola Sinfonietta, and under his leadership the orchestra quickly attained an international level of competence. After his successful tenure, the orchestra revised its operating principle, choosing three Artists in Association, each with their own speciality. The orchestra's needs and goals are gauged according to their potential. The Artists in Association appointed in autumn 2006 have frequently performed with the orchestra: pianist, conductor and composer Olli Mustonen, violinist Pekka Kuusisto, and British conductor Stefan Asbury. The repertoire of the Tapiola Sinfonietta focuses on Mozart and his contemporaries while also featuring rarely heard works, both in concert and on recordings. Contemporary music is well represented, and there are regular premieres of works by living composers. The Tapiola Sinfonietta gives concerts in its home hall at Espoo Culture Centre and at other concert venues and churches in the Greater Helsinki area. Many programmes are given a repeat performance in Sello Hall in Leppävaara, Espoo. The Tapiola Sinfonietta also collaborates with other orchestras and engages in audience education. Regular touring adds to the orchestra's profile, bringing the annual total number of concerts to about 60. In addition to giving concerts, the Tapiola Sinfonietta has a discography with more than 50 titles, to which on average three new discs are added each year.